Are you named Anthony or Armstrong? Audrey or Adams? If your first name or last name begins with the letter "A", then this set of vintage platinum rim Midcentury hiball glasses from the 1960s is for you! Yes, that's the ticket! 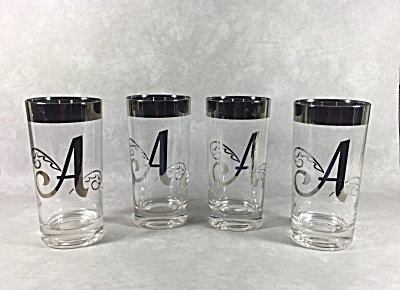 This set of 4 clear with "A" monogram tumblers/hiballs stands 5 1/2 inches tall. Each one carries the monogram "A" on one side. Very heavy 3/4 inch base which gives these glasses great stability and heft. So, let's see, which classic cocktail would you serve in your "A" glasses?